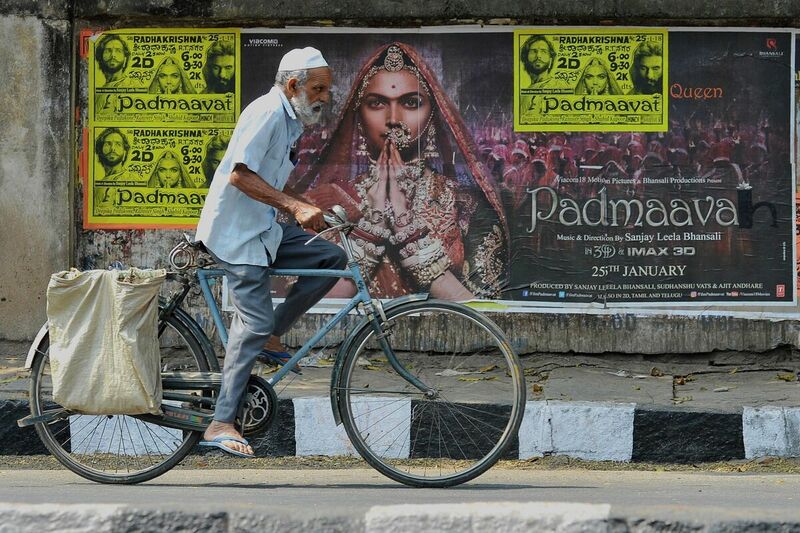 A Lavish Bollywood Musical Is Fueling A Culture War In India From the moment Padmaavat went into production, it's been plagued by violent protests over its depiction of Queen Padmavati, a legendary Hindu royal. A cyclist rides past a poster of the controversial film Padmaavat in Bangalore on Thursday. Padmaavat, India's first 3-D IMAX spectacle, is a lavish, operatic Bollywood musical set in the 14th-century palaces and deserts of Rajasthan. It has elephant processions, kaleidoscopic tableaus of Indian palaces and gorgeous actors in bejeweled costumes. It was directed by one of India's most celebrated filmmakers, Sanjay Leela Bhansali, and stars one of the country's most popular actresses, Deepika Padukone. The film opens in India on Thursday, but from the moment it went into production, it's been plagued by violent protests over its depiction of Padukone's character, Queen Padmavati, a legendary Hindu royal. "It's a historic film," Padukone told NPR in 2017. "And the character that I play is someone who, historically, there's a certain section of India that worships her." Queen Padmavati made her first documented appearance in a 16th-century Sufi Muslim poem about battles over her beauty. She has since risen to mythical status for how she protected her people's honor by burning herself alive, along with the women of her kingdom, in the face of an invasion by the Muslim sultan of Delhi. The practice, known as jauhar, is both banned and widely criticized today, but Padmavati's valor earned her a deified status; to many, she's a symbol of sacrifice and Hindu honor. The controversy stems from rumors that the film shows the queen in a dream love scene with the reviled Muslim invader. In fact, it doesn't, but in January 2017, fringe Hindu groups who revere Padmavati attacked the film's sets and assaulted filmmaker Sanjay Leela Bhansali. Indian film journalist Aseem Chhabra says, from the beginning, filmmakers tried to make it clear that the scene didn't exist. "There was no dream sequence; there's not a single shot of them together," Chhabra says. "And yet the rumors refused to die down, and so the protesters continued and continued and continued." In advance of the film's scheduled release on Dec. 1, several state governments called for an all-out ban, and at least one politician called for the beheading of Bhansali and Padukone. Chhabra says the controversy was tailor-made for India's 24-hour cable news networks. "There were these political leaders, some actually belonging to the ruling political party, who went on television and threatened to behead the director, to cut off the actress' nose. It's been shocking." Acclaimed Indian historian Sunil Khilnani says the battles over the film say much more about contemporary Indian politics than the country's medieval past. "What you're seeing in India is the weaponization of history; that's to say the use of historical figures — some who are mythic, some who actually existed but have now become sort of surrounded by myth — the use of them for present political purposes." Khilnani says the ascent of Hindu nationalism has led to a re-writing of Indian history, from revisionist interpretations of the origins of the Taj Mahal to documented historical events being reconstructed to reflect a "purer" Hindu essence. "What's unique about India is that all of the world's great religions over different times ruled and held political power — Buddhism, Islam, Christianity, Hinduism," Khilnani explains. "But the current Hindu majoritarian imagination is very anxious and insecure about that, and so it wants to wipe out what is actually the historical truth of Indian history, which is this multiplicity." The studio eventually caved to pressure from protesters and postponed the queen's big-screen debut. After a protracted bureaucratic process, led by India's Central Board of Film Certification, the film was cleared for release with several modifications. In an unprecedented move, the board assembled an outside panel of historians and cultural experts to preview the film. Its original title was changed from Padmavati to Padmaavat, a reference to the poem about the queen, and multiple disclaimers were added to reflect the sensitivities it has inflamed. The film's central song sequence, featuring Deepika Padukone dancing among hundreds of extras, has also been modified with CGI to cover her bare midriff out of respect for the queen's revered stature. But despite the modifications and the added fabric, the protests haven't died down and Chhabra says cinemas near his home in New Delhi will be guarded by police and soldiers through opening weekend. "It's not something that we can just say, 'Oh, it will pass,' " he adds. "There are people out there who — they don't want to be quiet. And none of them have seen the film, that's the unfortunate thing." Khilnani says, more than a victory for freedom of expression, Padmaavat's release on the eve of India's Republic Day on Jan. 26 (marking the day India's constitution came into effect) is a kind of "narrow escape" for freedom of expression in the world's biggest democracy. He says, "I think the important thing to remember here is the many, many other works which don't get this attention and which do get suppressed, whether it's writers in the Tamil language ... whether it's journalists in Bangalore who get killed for what they write, this is happening across the board across India. Even though this particular film isn't a great work of art — it's a song-and-dance gala, really; nevertheless, I think if one allows these kinds of victories to those speaking in the name of a narrow majoritarian imagination, it cedes important ground."